Friends, I was contacted by Halftee last early last week and was asked if I'd like to check out their product. After perusing the website and getting *excellent* customer service via instant chat, I decided that this is an awesome product to share with you all! 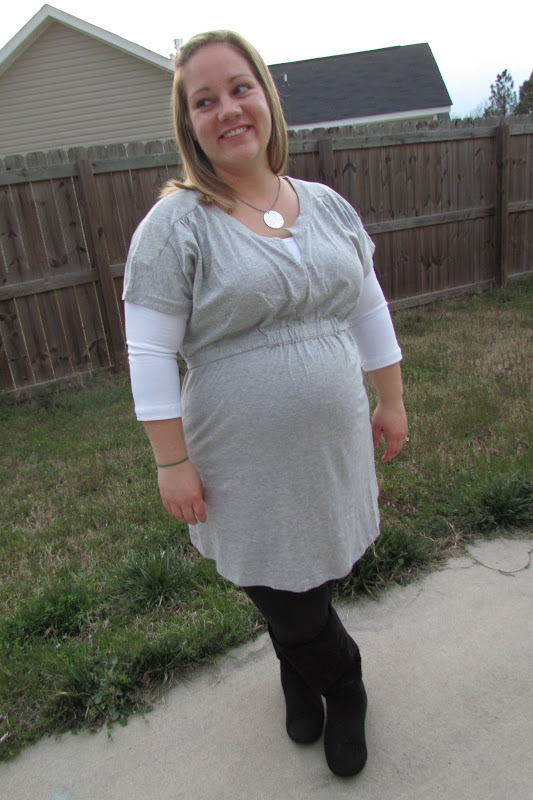 Not only is this a great maternity wardrobe staple, but Halftee is a great option for women and girls who want to layer without so much fabric or add modesty to a more revealing top or dress. I embraced the maternity marketing, obviously, and love the idea that you can lift a top or unwrap a wrap dress with a half shirt underneath for nursing. 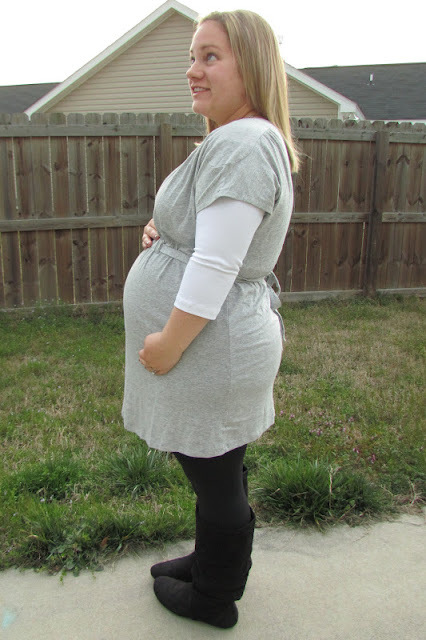 Also, a layering piece that will fit my body through my entire pregnancy? Yes, please! It doesn't have to fit the belly! I chose to try the 3/4 Halftee in white. It's an obvious color choice, but the sleeve length will be able to transition with me between the colder and warmer months. Last night was a perfect opportunity to try out my new piece! I went to church for a meeting with my mentor and although my outfit isn't necessary revealing, the low cut "V" in the front comes a bit lower than I'm willing to show. (This was also an emotional, DEEP meeting with God, so excuse my no-makeup approach. I knew tears would be shed.) Especially at church! My Halftee covered what needed to be covered, added a little extra warmth without fuss and creases from a full layered shirt, and didn't change the integrity of my outfit at all. I was so comfortable, I could have slept in it! The fabric is thick, sturdy, but soft cotton that stretches with your body, but doesn't stretch out or give too much. I ordered one for Little S. to try as a layering piece under her sleeveless dresses so she can wear them during the earlier Spring months. I can't wait to show you hers! *disclosure: The reviewed product was provided by Halftee. All opinions are my own and I truly believe in this awesome product!